Best Kiev Tours and Apartments at Kiev Apartments we work and set the tour for you so you will enjoy the way you want it and with time limits you set. 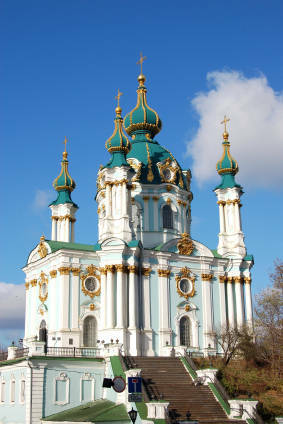 Kiev is one of the biggest cities in Europe. It is a bustlingcapital of independent Ukraine, its administrative, economic,scientific, cultural and educational center. This scenic city withpopulation of over 5 million people is located on the shores ofthe Dnepr River. Kiev is a city of richest and ancients historical and cultural places, a city of great events and outstanding, hospitable people. Everyone will find there something unique and interesting. 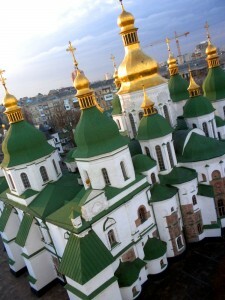 The art and architecture of Kiev are considered to be the one of the best in the world. Many famous artists, poets and writers estimated the unique beauty of this city. Many advice to visit just to mark it down down and to really see the beauty that city can have and be. Saint Sophia Cathedral-the most ancient among still existing monasteries and cathedrals, is one of the best historical and cultural monuments of Kiev. 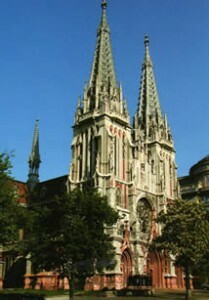 As you look at the cathedral from the top you will see the interesting structure of the main Church – one big Golden Dom and 12 small – as a symbol of Jesus and his disciples. Visiting this historical miracle and the base of the Kiev Rus christian history you will acknowledge the history of foundation and as well as will be able to see the biggest collection of mosaics and frescoes of the 12th century. The one that we recommend to view is the fresco “Blessed Virgin Oranta” – think of the size! – 6 meters or 20 feet high – that symbolize defense and protection of Ukraine. Another exhibit to see is the “Yaroslav the Wise’s burial place”, who we know as one of the wisest and powerful leaders of the past times. St. Andrew Church was built by Italian architect Rastrelli. As Elizabeth travelled around Ukraine and saw the beauty of it and had decided to leave something behind so people will remember her and will think of her with gratefulness. The Church is located right near Andreevsky spusk/slope as well known tourist place where most of the tents and stand with souvenirs are located. Slope uniting old Podol that is known as one of the oldest districts of Kiev and Upper Kiev with St. Sofia and St. Michael Cathedral.When you arrive and see that the church is open – make sure you get into it and see it. It is very seldom that church is open as most of the time it is under reconstruction.As you go down to Podol and stop by Bulgakov musiem make sure you will see the sun-dial and the fountain Samson. THE Golden Gate – at the old times as ships were approaching to Kiev all they could see from far is golden dooms of the churches and Cathedral shining from the sun. Later entering to the city by the gate- the gate was called the Gate of the Golden city – the GOLDEN GATE as we know today. 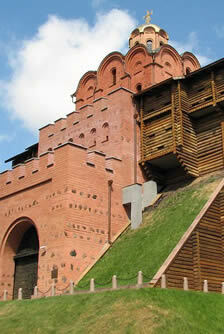 it was build by Prince Yaroslav the Wise (1019-54). The last renovation taken place in 1983 where from the ruins of ancient times – Golden Gate – built and restored to their present condition. The Golden Gate has a Museum right inside where you can feel and touch the walls with a history of 1000 years old. From the balconies of the museum you can see the great panoramic view of Kiev. 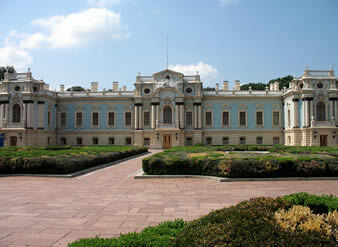 Mariyinsky Palace – was build in 1752-1770 by the order of Elizabeth. She thought one memory by St. Andrew Church is not enough and commended for another great place – Palace to be build. The palace was reconstructed to the present view at 1870. Nowadays the palace is an official residence of the President of Ukraine with few tours inside that take place very rare as again this place 80% of it is time under reconstruction. What do Presidents do there so it is closed all the time we do not know. 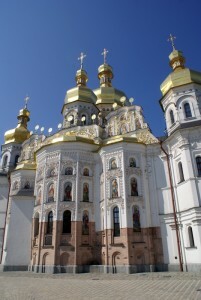 KIEV LAVRA MONASTERY(KIEVO-PECHERSKAYA LAVRA)One of the most big and must places to visit is Kiev Lavra. The first thing you see as you enter Kiev of the Bridge is the statute of Motherland and Golden dooms of Lavra. As in 989 the Kiev Russ was baptized it lead to more churches and monastery to be planted. Kiev Cave Monastery was opened in the caves in 1051 by the 2 monks. It is now the center of the education and literacy for the old times orthodox history. The caves are present even our days and a must place to visit – there are near by and far off caves or they are also called catacombs and to feel the full impact we recommend visit both. Caves hold many mysteries but do not get lost there as step away from the lighted rout will take you to darkness. Not to bother you with other historical details we invite you to the great tour we do with fun and not in books facts and stories. Big Catholic church or known as House organistic and chamber music is located in the very central part of Kiev and is known now as a concert hall from the February 1980 p. The sounds of the Organs are outstanding and many come to listen to the music.THE design of the church is so great and memorable that we recommend to visit the place just to take pictures and listen to the sounds. Chernobyl Museum was opened in 1986 and tells about radiation influence on humans,animal and plant life, about heroic actions of liquidators. What you will see there will change your life and understanding of helplessness of humans. 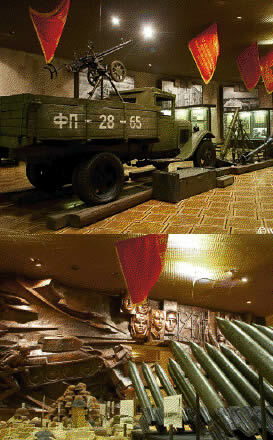 some of the Exhibits are brought right from the Chernobyl.Museum of World War II right under the statute of motherland there is a great museum that will take you back to 1938-1954 – the times of one of the biggest war in the history of USSR and activity of Anti-Hitler Coalition, and to heroism and sacrifices of the nation. There are 3 floors with exibits: one is dedicated to 1941-1943; second 1943-1954; third one in Golden letters names of all the Heroes of the War – the names of people we give thanks to.